Project Progress – ΑΤΤΙΚΟ ΜΕΤΡΟ Α.Ε. Information about the progress of all projects is presented below. The most extensive front of Metro Projects ever performed in Greece is currently progressing at an intensive pace. All ATTIKO METRO employees make a co-ordinated effort on a daily basis to deliver the modern Metro Stations in several areas of Athens, in Aghia Marina, in Aghia Varvara, Korydallos, Nikea, Maniatika, in the Port of Piraeus and in Dimotiko Theatro in the area of Piraeus. The Metro Line 3 extension, 4.3 km long, with 3 modern Stations extending from Monastiraki to Egaleo was commissioned in May 2007. In December 2013, another Metro Station – AGHIA MARINA – was added to the 1.54km long Line 3; it is anticipated that this Station will serve approximately 30,000 passengers on a daily basis. It is noted that this contracting work had also included the construction of a Parking Facility for Private vehicles, right next to the Station, with an overall capacity of 382 places. Moreover, one of the most significant projects of this extension was the construction of ELEONAS Depot that was handed over to STASY S.A. in July 2011. Concurrently, one of the most extensive Municipalities in Greece, the Municipality of Peristeri, acquired two more new Metro Stations in April 2013 (PERISTERI – ANTHOUPOLI), after the successful completion and operation of AGHIOS ANTONIOS Station in summer 2004. It is also pointed out that the relevant square of the Municipality that covers an area of 10,000 square meters in total has been configured and re-developed. 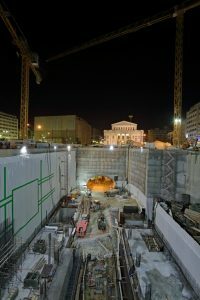 In July 2013, the project of the extension of Line 2 to Elliniko was added to the Athens Metro network 5.5 klm of underground Line and 4 new Stations (ILIOUPOLI, ALIMOS, ARGYROUPOLI, ELLINIKO). More specifically, upon the addition of the subject extension to the Metro network, it is estimated that the Metro daily ridership increased by 83,000 passengers. On the contrary, daily trips by car will be reduced by 50,000. In December 2010, Line 3 northern end was fully developed with the commissioning of AGHIA PARASKEVI Station. HOLARGOS Station was commissioned earlier, July 2010 and NOMISMATOKOPIO Station in September 2009. In the framework of the same contracting work, a Bus Transfer Station is constructed in the area of NOMISMATOKOPIO station which is the first Metro Station on Messogion Avenue that can be used by commuters, residing in Aghia Paraskevi, Messogia region and the eastern suburbs of Attica region. An underground Parking Facility for private vehicles of a capacity of 630 places has also been delivered to public. The Athens Metro, is now extending to Aghia Varvara, Korydallos, Nikea, Maniatika and Piraeus, with 6 new stations and 7.6 km. of underground line. More specifically, the Contract for the extension of line 3 to Piraeus with the constructing joint venture J&P AVAX, GHELLA SPA and ALSTOM TRANSPORT was signed in March 2012 and the construction of the project commenced.